July 18, 2018 -- Researchers from a start-up company in New Zealand have scanned the first humans with a spectral CT scanner based on solid-state digital detectors. The technology produces color images at much higher levels of resolution than traditional CT scanners and, thus, may improve diagnosis. Mars Bioimaging was founded in 2007 by Phil Butler, PhD, and his son, radiologist Dr. Anthony Butler from the University of Canterbury, to develop CT technology based on spectral imaging, in which x-rays at different energy levels are sent through an object simultaneously. The technology uses this spectral information to produce 3D images of objects, with separate regions represented by a variety of colors and not just the black and white of conventional CT.
Mars has developed spectral CT scanners for preclinical use, but the company recently set its sights on the medical imaging market. The vendor has developed a clinical version of its technology that's able to scan humans, and it recently released the first clinical images. 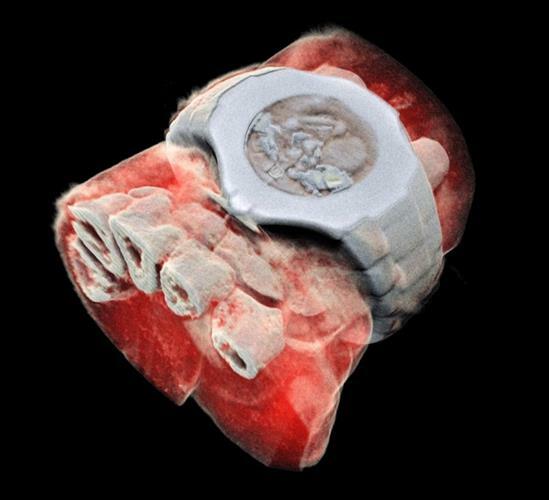 A 3D image of the wrist acquired with the Mars spectral CT scanner. Image courtesy of Mars Bioimaging. Mars has integrated into its scanner the Medipix3 solid-state digital detectors developed at the European Organization for Nuclear Research (CERN). In terms of clinical imaging, the scanner is able to distinguish the density of different types of materials, from low-contrast tissue containing lipids and water to contrast agents such as gadolinium and iodine, according to the group. This feature, in addition to the scanner's small pixel size and accurate energy resolution, allows clinicians to noninvasively examine discrete components of patient anatomy in high detail. "X-ray spectral information allows health professionals to measure the different components of body parts such as fat, water, calcium, and disease markers," Dr. Anthony Butler said in a release from the university. "Traditional black-and-white x-rays only allow measurement of the density and shape of an object." Furthermore, the Mars scanner has a proprietary reconstruction algorithm that can remove metal artifacts and reduce noise during automated image processing. Users also have the option of accessing the raw data and applying different image processing and reconstruction techniques instead. Mars executives believe the scanner will be able to provide far greater detail of the body's chemical components. "So far, researchers have been using a small version of the Mars scanner to study cancer, bone and joint health, and vascular diseases that cause heart attacks and strokes," Dr. Anthony Butler said. "In all of these studies, promising early results suggest that when spectral imaging is routinely used in clinics, it will enable more accurate diagnosis and personalization of treatment." The team is planning a clinical trial that will involve scanning orthopedic and rheumatology patients at several hospitals in Christchurch with the machine, and then comparing the image quality and clinical outcomes with those of standard imaging techniques.